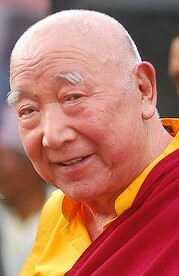 The most venerable Khenchen Appey Rinpoche was born in 1926 in Serjong, near Derge in eastern Tibet. Although he was recognised as the incarnation of a Kargyu Master, his father, who was a staunch Sakyapa, placed him in the village’s Sakya monastery at the age of eight. When he was 13 years old, he began studying Buddhist philosophy at Serjong Monastic College. 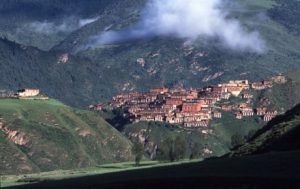 At the age of 22, after nine years of intensive study under the tutelage of Lama Lodrö, Appey Rinpoche went to Dzongsar Shedra, Tibet, to continue his philosophical studies. Founded by Jamyang Khyentse Chökyi Lodrö in 1917, this shedra was the most renowned monastic university for the study of philosophy as taught by all the Buddhist traditions. At Dzongsar Shedra, he also received the esoteric teachings of the secret mantra vehicle from Jmayang Chökyi Lodrö and was appointed as a senior revision teacher. Following his graduation from Dzongsar Shedra, he went to Lithang in eastern Tibet to meet the great master Deshung Ajam Rinpoche. There he received many rare and valuable teachings on the tantras, which he later transmitted to his disciples and many high lamas. At the age of 25, he was enthroned as the abbot of Serjong Monastic Institute and conducted philosophical classes there for a period of four years. In 1956, at the age of 30, he embarked on a very long journey to the great Ngor Evam Choden monastery in Central Tibet, where he received Bikshu (Tib. gelong) ordination as well as many special teachings of the Ngorpa lineage. The Ngor abbots immediately recognised Appey Rinpoche’s mastery of Dharma and appointed him head Khenpo of their philosophical institute. He taught there for approximately two years before going into exile in Sikkim in 1959. Appreciating Rinpoche’s scholastic achievements, the Queen Mother of Sikkim asked him to work at the National Library in Gangtok, and he continued in that post for several years. 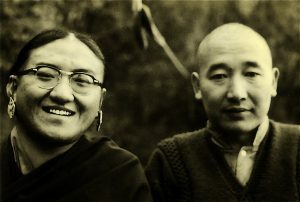 In 1963, His Holiness the Sakya Trizin had relocated to the Dehra Dun area in Northern India and invited Appey Rinpoche to join him as his principal tutor. Both HH Sakya Trizin and Appey Rinpoche wanted to establish an academy where monks could study Buddhist philosophy. 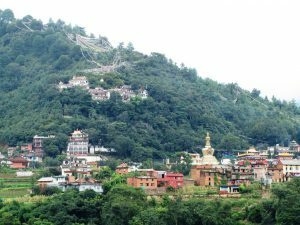 With this in mind, the Sakya College was founded in 1972 and was eventually established in its permanent location on the road to Hill Station Mussoorie, near Dehra Dun. 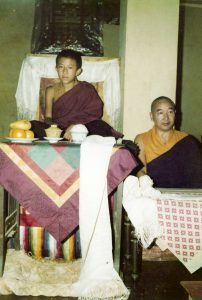 From 1972 to 1985, Khenchen Appey Rinpoche was fully responsible for teaching the classes, supervising the administration and raising funds for the college. When many of his students had reached a high level of proficiency and Sakya College was fully established, Khenchen Appey Rinpoche requested permission from HH the Sakya Trizin to go to Nepal. At first no-one knew exactly where he had relocated, but it was later discovered that he had gone to Pharping, a renowned pilgrimage destination for Mantrayana practitioners, to devote himself to meditation. He spent five years in secluded retreat practice there, and as more people became aware of his presence and wisdom he began receiving more and more requests to teach. The Venerable Appey Rinpoche made several teaching trips to Singapore. In the course of travelling abroad and giving teachings, he became increasingly aware of the need for a school that would make the Dharma accessible to foreigners. Also, at Sakya College in India, he was requested to establish a school where non-Tibetan speaking lay people could study Dharma. Since it was not possible to do this in Sakya College, he established the International Buddhist Academy in 2001. IBA was officially inaugurated by HH the Sakya Trizin in Tinchuli, Kathmandu. 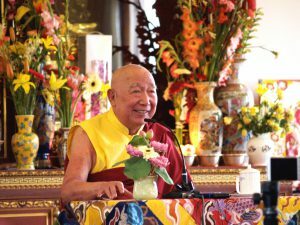 Rinpoche established the initial goals and launched the Academy by teaching one of the first courses himself. His teaching was on this very text – Sakya Pandita’s Clarifying the Sage’s Intent. The main goal was to teach the Buddha Dharma, making it accessible to international students in an authentic and profound way. His second priority was to translate the holy Teachings and commentaries into English, Mandarin and other world languages. These two goals led naturally to the publishing and distribution of texts. In 2007, Khenchen Appey Rinpoche expanded IBA’s mandate to include a multi-year “School of Leadership” for post-graduate monastic scholars to learn leadership and language skills. In 2008, a new program for non-Tibetan speakers to participate in a two-year “School of Translation” intensive training program was developed. His Holiness has encouraged both the IBA monastic scholars and the IBA translation intensive participants to develop their abilities to work together on translation teams and in research projects. Khenchen Appey Rinpoche also visited his home monastery in eastern Tibet, where he gave teachings and funded the refurbishing of the ancient ruined monastic college and a new dormitory for the monks. He also provided funds for the construction of a new multi-storey assembly hall. He completely furnished these buildings, providing among many other resources, one thousand eight-inch Buddha statues from Nepal for the assembly hall and a significant collection of the complete publications of the great Derge printing press for the monastic college. He also renovated the monastery’s old retreat centre and provided his monastery with an endowment fund from which annual grand pujas and other important ritual observances are still being sponsored. Through various means, Khenchen Appey Rinpoche was able to collect many rare manuscripts of the Sakya and other schools for the IBA’s library. He invested a great deal of his time and resources in collecting these precious texts, digitizing, publishing and distributing them to monasteries, monastic schools and libraries in many parts of the world. Many of these texts are now available online at A Sakya Digital Library. 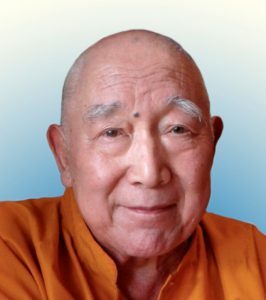 Another of Rinpoche’s significant contributions was designing a curriculum for the Vajrayana Institute, a monastic college that was newly founded by His Eminence Luding Khen Rinpoche, in India. Rinpoche retired to a private residence in Boudha, near both IBA and the great stupa. However, he always made himself available to those who sought his guidance, continuing to give private teachings, especially to lamas and khenpos. He was renowned for the precision, vastness and inspirational power of his teachings. Out of sincere humility, Khenchen Appey Rinpoche avoided the attention of admirers. He did not want people to prostrate to him and preferred that people not call themselves “students” of his, but rather “Dharma friends”. For his personal letterhead, he simply used the letter “A” without any ornament to embellish his identity. In 2009, Rinpoche manifested an illness in the form of cancer in his oesophagus. He underwent treatment, but never fully recovered from the strong side effects. In 2010, he compassionately hinted at the inevitable approach of his death when he said to some of his students, “This disease is not going to go away. I am creating lots of trouble for many people.” While in control of the process, he passed away peacefully in late December. Venerable Khenchen Appey Rinpoche lived a most meaningful life, dedicated exclusively to the Buddha Dharma.